Most people wish they had straighter teeth but can’t stand the thought of having to wear braces. 20 years ago, this would have been your only choice if you really wanted straight teeth, but fortunately, dental technology has come a long way since then. What if we told you that getting beautiful, straight teeth was as easy as slipping in a clear retainer? That’s the beauty of Invisalign®! At Trillium Dental in Ottawa, we are pleased to offer Invisalign as a comfortable and subtle alternative to traditional braces — an opportunity many people take advantage of to straighten their teeth during adulthood. Our dentists and dental hygienists are big proponents of choosing Invisalign over braces, and many of them have used this teeth straightening method themselves. That being said, here are some reasons why we recommend that you choose Invisalign over braces! One of the main reasons why so many adults choose Invisalign over braces is because they are much more subtle, leading them to feel less self-conscious in social situations. It’s understandable that people with braces would feel uncomfortable talking to their friends, colleagues, and even strangers when all others can seem to focus on is the metal brackets lining their teeth. Anyone who has had braces will tell you that it is not uncommon to have food stuck in your braces without even noticing, which can land you in an awkward situation when people stare. As the name indicates, Invisalign offers a practical solution to this, as the clear retainers (also referred to as “clear braces”) are much more inconspicuous. Though not all adults mind the appearance of braces, most prefer a more subtle alternative like Invisalign so they feel more comfortable going about their daily tasks as normal. Odds are, you’ve spoken to several adults who have Invisalign retainers and didn’t even notice! Another major benefit of Invisalign retainers is that they are much more comfortable to wear than braces — they won’t cut your cheeks, irritate your gums, or get jammed up with food. Unlike braces, which are often painful (especially after being tightened), Invisalign retainers fit snugly on your teeth without digging into your gums and can be removed at any time. Though we do not recommend removing your Invisalign retainers for anything other than eating, drinking, and brushing your teeth, you at least have the ability to do so if and when needed. More often than not, patients who choose Invisalign over braces complete the teeth straightening treatment in less time — 15 months, to be exact. Of course, this depends on how diligent you are about wearing your retainers, and if you only remove them for the reasons mentioned above, you should have straight teeth in just over a year. Braces, on the other hand, are much more unpredictable in terms of treatment duration — in fact, some people end up wearing braces for more than two years. 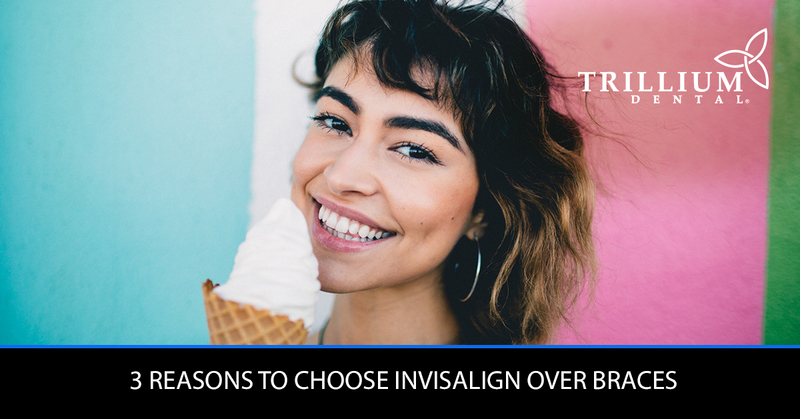 We hope that this blog post has given you a better idea of why Invisalign has become such a popular cosmetic dentistry treatment and why so many adults are opting for clear braces. Ready to schedule your consultation? Visit Trillium Dental in Ottawa today, or schedule your dental appointment online!